Seeing the tide of commentary from people lucky enough not to find the image of a black child in the H&M monkey hoodie offensive is amazing. First of all, the young boy in the advert is black and the slogan on his sweatshirt says: The Coolest Monkey In The Jungle. For many years a derogatory and racist slur against black people was to refer and compare them to monkeys and apes. This wasn’t just about skin colour but also inferring that black people were just a bit wilder and more savage than white people, most times a way of justifying racism and racial biases. This particular slur isn’t as comparatively common these days but it isn’t long ago that this was considered acceptable by some and I still regularly read outright slurs and people comparing black people and monkeys and apes as if there was a special connection -- one that excludes white people. Some racist papers even went as far as making the scientific argument that Black people share a lot in common with monkeys. Not too long ago, human zoos were the entertainment delicacy of the day. It is not too dissimilar to modern football entertainment, but with a better fee. 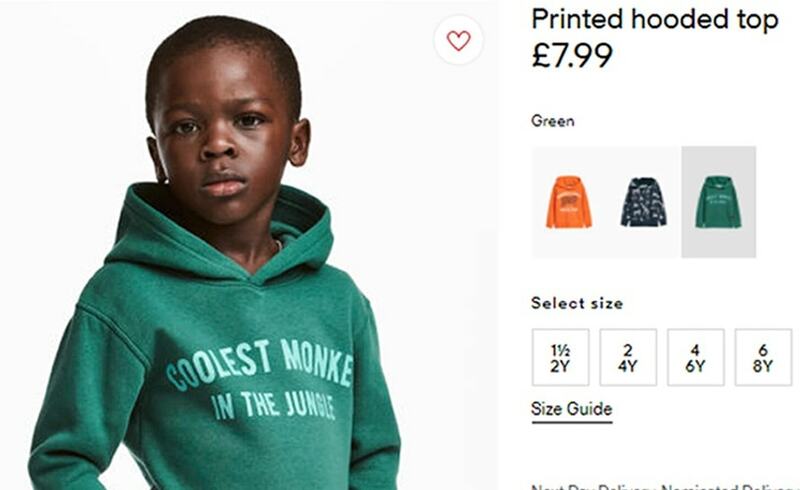 The H&M advert is incredibly offensive because someone put this racist label on a black child, obviously a team of adults who should have known better than to be careless about the social details of history. It is also incredibly stupid that it makes someone wonder why no one realized the implications of this and whether given the amount of eyes on this ad it is more likely that someone either didn’t feel like they could have spoken up, or did speak up and weren’t listened to. Given the recent controversy of the Dove advert, I would hope that people had learned it is important to always think things through and and not just ignore important details. The word monkey is a very loaded word when used in conjunction with black people. It’s historically used as a racial slur, and even in modern times, almost always used in a derogatory way. If not, why are football hooligans so very fond of using it to abuse black footballers and why was an image of Michelle Obama sabotaged to make her resemble a monkey? Sitting in a position of privilege, which allows you not to see the image as offensive, doesn’t mean that it’s not.